Barb and Leo had home building, home contents and comprehensive car insurance all with BIG INSURANCE COMPANY. They are newlyweds who recently moved into a bushfire prone region. On a particularly devastating summer’s day, while visiting her sick grandma in another part of the state, Barb heard news that her home town had been ravaged by bushfires. It was reported that the fires wiped out the whole town. A phone call to the local relief centre confirmed Barb’s worst fears. Her house and her car were all completely engulfed by the sudden onslaught of the bushfires. Fortunately Leo is safe but they have nothing left. Barb & Leo will definitely claim under their existing insurance policies but don’t know where to start or what to expect. They are too overwhelmed. If you have insurance, the damages and losses resulting from bushfires may be recoverable depending on what type of insurance you have and the extent of that cover. Life Insurance covering injury, disability and/or death. It may be stand-alone insurance through a life insurer or as part of your superannuation benefits. If you have life insurance through your super, some policies will cover you even if you are no longer employed. If you think you may have insurance but you can’t remember which company it is with, ring the Insurance Council of Australia on 1300 728 228. When there has been a large scale disaster event there is usually also a dedicated Catastrophe Hotline 1800 734 621. Your superannuation fund can tell you about any insurance attached to your superannuation in the event that there has been a death or severe injury resulting in disability in the family. PART 2: DOES MY INSURANCE POLICY COVER ME? Do not be concerned if your policy documents have been lost or destroyed, insurance companies keep records electronically and only require the policyholder’s name and address in order to process a claim. Your insurer is obligated to send you a copy and may have them available online. One of the first things you should look for is whether you are covered for the costs of temporary accommodation. More about this is found below in Part 4: Additional Benefits under your policy. Take reasonable steps to minimise your loss. If you can secure your property from further loss, for example, putting a tarp over your contents if they are exposed or moving it under shelter. Try and document this with photos, invoices and evidence of any directives from council or local emergency services. If you do not do this, the insurer may reject any claims arising out of subsequent damage because of this. You should be mindful of your insurer’s rights to inspect your property or determine whether buildings or contents should be repaired/rebuilt/replaced and by who. You should talk to your insurer to try and get their consent before performing works. NOTE: In the event of a major disaster event, some insurance companies may not expect you to itemise all of your contents if your home and everything in it has been totally destroyed – they may agree to just pay the full amount insured, particularly if the amount claimed seems reasonable for the size of the family and the size and value of the home insured. Sometimes, in a large bushfire event, there may be the possibility that some person or entity will be found responsible for starting the fire. If there is a possibility that, for example, a large company, or the government, may be found to be liable for the event, and your insurance is insufficient to cover all your loss, you may want to gather such evidence anyway just in case there is court case, inquiry or other source of compensation. If you are not sure what you are covered for, you should get a copy of your Product Disclosure Statement and Policy schedule and your Certificate of Insurance covering the date of the bushfire. Many insurance policies cover bushfires as an insured event. There may however be limitations on whether or not fire damage includes bushfire damage and to what extent. The extent of your cover will ultimately depend on the wording of your particular Policy. Many policies also impose a general obligation on you to take reasonable precautionary measures to prevent loss – for instance clearing your gutters to reduce the risk of leaves in the gutter catching fire from embers carried by the wind. This only requires reasonable measures – you should not risk your health or safety or disregard local planning laws. What is reasonable can be argued about, especially if the fire was sudden or of unavoidable ferocity. Have an embargo or time delay (e.g. 48 hours) after you’ve entered into the insurance contract for the policy to take effect in relation to bushfires. This is important because you will only be covered after this time delay but see the section on “Non Disclosure” below. Exclude cover where there has not been any actual flame damage (such as damage from scorching, melting, heat, smoke, ash or soot). Limit cover where you have not taken adequate precautions to prevent damage or loss. GOLDEN RULE: It can be difficult to work out what is covered by your policy so if you are unsure get advice from the Insurance Law Service 1300 663 464, or your private solicitor. Provide copies of any transcripts of telephone calls (if applicable). PART 3: WHAT ARE TYPICAL ISSUES TO CONSIDER IN BUSHFIRE INSURANCE CLAIMS? If you have indemnity cover, your insurance policy will generally cover you for actual losses up to the sum/s you are insured for. If you have this type of policy, your certificate of insurance will state what amounts you are insured for – for instance “Up to $400,000 for building, $20,000 for contents”. There may be limitations – for instance if you choose not rebuild but sell the land, your policy could say that your insurer may only pay the value of the property. If you have a replacement cover, your insurer should cover you for the amount it would cost to replace or repair damaged building/contents to the condition it was in just prior to the fires. For either, you may also be entitled to other Additional Benefits under the policy, see below. Underinsurance is a problem with indemnity cover, where the amount you are insured for is not enough to cover your loss or damage. This is a major problem particularly in times of natural disasters such as floods or bushfires, as the cost to rebuild can easily rise due to the increased demand for builders and building materials. Insurers are only obligated to cover you up to the amount you are insured for. However, your insurer has a duty to clearly inform you in writing that their liability is limited to a particular amount before the contract is entered into. The reverse side of this is over-insurance is where you are insured for more than the amount required to cover your loss or damage. Over-insurance can be one way of creating a buffer to make sure you are fully covered. However you need to be aware that you will not be entitled to an automatic payment of this higher sum. The insurer is entitled to reduce your payout to the amount of your actual loss, and you will not be entitled to any refund of the higher premiums you paid because you were over-insured. IS IT THE INSURER’S FAULT THAT I AM UNDERINSURED OR OVER-INSURED? Generally no. When you first take out a policy and at every renewal it is your obligation to review the amount of cover the insurer is offering to ensure that it meets your needs and expectations. If you feel you have been clearly misled by your insurer into getting too little or too much insurance get legal advice. handle any complaint about the quality and timeliness of the work or conduct of the repairer (clause 7.20b). If you agree to a cash settlement and engage your own repairer, any issues arising from the quality of repair will be an issue for you to sort out with your own repairer. Most insurers will have clauses about the standard of cover – for instance, matching of materials with what you had before, or “new for old”. Usually “new for old” has its own definition under the policy. You should read your policy to see what level of cover you have and the extent the insurer has to try and source the same materials you had before the event. In contents claims, the insurer may pay your claim not in cash but in store credit. The insurer may be able to do this if there is an express right to settle in the terms of the policy that they can pay your contents claims in this way. If you are not happy with store credit check your policy wording. If the policy is silent on a store credit you could ask for cash as an alternative. However, you should be aware that the insurer may reduce your cash settlement to a lower amount than the stated value of the store credit. This may be because the insurer has an arrangement with one retailer (such as a volume discount) which enables them to pay less for the credit than the dollar amount you are able to spend. Many insurance policies allow insurers to only indemnify you as to the cost the insurer would have to replace the item rather than the retail value. Policies vary so get advice if you are not happy with the arrangement and the policy is unclear. You need to be clear on what you are settling, if it is the whole claim or only part of it eg. contents. You may have “Additional Benefits” on top of the amounts you are insured for building and contents. You need to be very careful about accepting a settlement agreement! Get legal advice. Once the claim is settled, you may be prevented from asking anything further from the insurer. This will vary on a case by case basis and on the wording of the settlement. If you have a mortgage over your home that has been damaged or destroyed the insurer may pay the amount of your claim directly to your home lender. In this case you will need to negotiate with your lender about the release of the funds for rebuilding or repair. If there is a problem with this process you should get advice about your options. There may be additional benefits under your home building and/or contents policy which may cover you for emergency/alternative accommodation, removal of debris and demolition, architects, surveyor and legal fees etc. These additional benefits can be in addition to your sum insured. Therefore, before agreeing to any settlement of your claim, it is important that you check to see if you are entitled to more than your sum insured through the existence of additional benefits cover. If you can no longer live in your house, you should contact your insurer and check your policy to see whether you have temporary accommodation entitlements and for how long. If you have been relocated to emergency “community” accommodation, it is also worth contacting your insurer to determine whether you are eligible for emergency “private” accommodation. If you live in a remote area, there may be no private accommodation available. Contact your insurer to determine what is likely to happen in such cases. The costs to remove such debris from your property and clear your land can be significant. You need to carefully check what types of “debris” is covered. For instance, debris from trees, shrubs and plants may not considered “debris” under the policy. This exclusion may be done through a series of clauses. Make sure you look out for these. However, if you see any clauses in your contact such as the following you will know you are not covered for trees and shrubs debris. The above policy only covers the removal of debris to “buildings or its contents”, and because “trees, shrubs and plants” aren’t considered buildings or its contents, the removal of fire damaged trees and plants are not covered by the policy. Reading a policy can be difficult, and you should contact us for specific advice if you need assistance. Most home building insurance policies provide additional cover for the costs of the services of architects, surveyors and legal fees in rebuilding and/or repairing damage to buildings. After significant event like bushfires, sometimes local councils will impose new regulations and fire safety standards for bushfire prone areas. New regulations may also have been introduced since your home was initially built. It is likely that you will be covered for additional compliance costs if your policy is to replace your property “as new” or if you have “total replacement cover”. PART 5: THE CLAIMS HANDLING PROCESS – WHAT HAPPENS AFTER I LODGE MY CLAIM? After you lodge the claim, the insurer will send out an assessor and possibly builders or engineers to inspect your property and help determine whether you claim is covered. 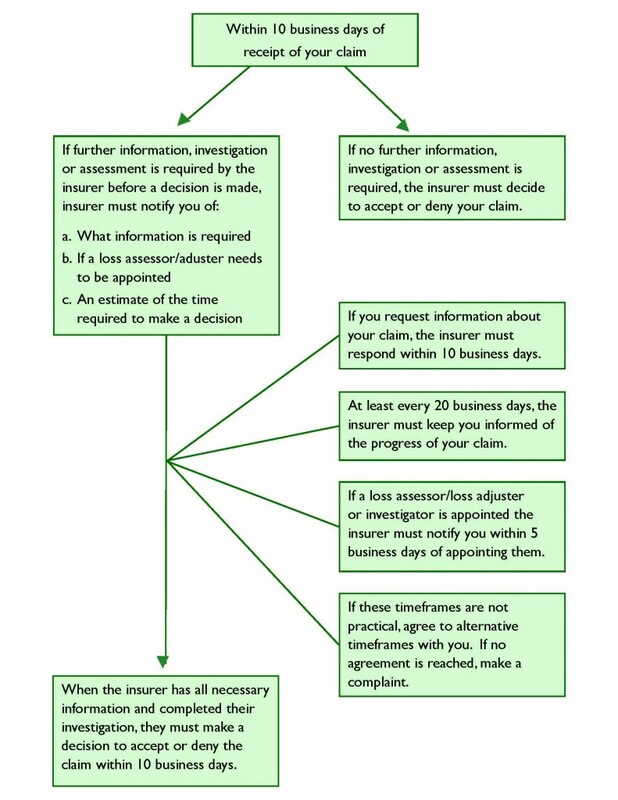 There are guideline timeframes insurers should follow in how long the claims process should take. This is outlined in the General Insurance Code of Practice. Generally the insurer should make a decision on your claim within a maximum of four months, unless exceptional circumstances apply. Exceptional circumstances include where there has been an extraordinary catastrophe or disaster declared by the Board of the Insurance Council of Australia. In these circumstances the maximum time to make a decision on a claim is 12 months, but you may complain to the Australian Financial Complaints Authority (AFCA) at any time if you are dissatisfied with the progress of your claim. This Code also obliges your insurer to fast-track your claim if you are in urgent financial need (Clause 7.7a) and to make an advance payment within 5 business days of you satisfactorily demonstrating your urgent financial need (Clause 7.7b). Any advance payment will be deducted from the total value of your claim. PART 6: WHAT CAN I DO IF MY CLAIM IS REFUSED, OR IF THE CLAIM IS TAKING TOO LONG? HOW DO I RAISE A COMPLAINT? 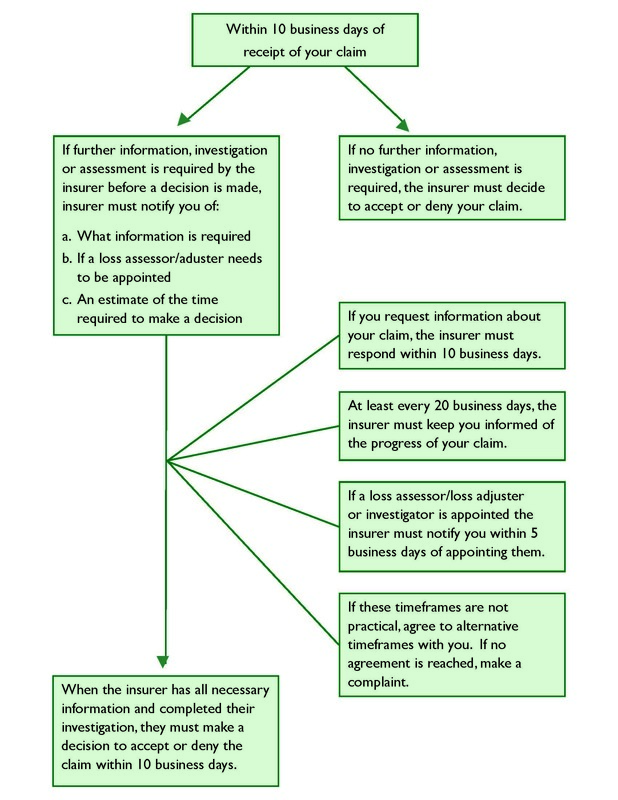 You should gather as much evidence as you can and provide copies to your insurer. If your insurer is relying on expert evidence, you should consider obtaining your own independent expert report to support your dispute. You can also consider court proceedings, however you should speak to a private solicitor for advice first as court is risky and you may be made responsible for the insurer’s legal costs. GOLDEN RULE: It can be difficult to work out what is covered by your policy so if you are unsure, get legal advice. You can call the Insurance Law Service on 1300 663 464 on Mondays through Fridays between 9:30am to 4:30pm. If you cannot reach us on this number and have an urgent bushfire inquiry, you can also reach us through the National Debt Helpline on 1800 007 007 from 9:30 to 4:30pm Mondays to Friday. What can I do if my car insurance claim is refused? If you are a tenant affected by the bushfires either from having your possessions burnt or your rental property damaged or destroyed, please contact a Tenants Union in your state or territory for tenancy advice. NSW residents may contact Law Access on 1300 888 529 for a referral to your nearest Tenants Union. DO YOU HAVE A MORTGAGE OR OTHER LOANS? You should contact your lender immediately to ask for hardship assistance. This is most commonly provided in the form of reduced or postponed repayments, usually for 3 to 6 months at a time. When catastrophes happen, some lenders may offer even more generous assistance and you should explore that avenue as well. If you do not do anything, not paying your loan/s pending the outcome of an insurance claim will result in additional interest and enforcement fees being added to your loan and may result in legal action. There are also services such as the No-interest loans scheme (NILS) which can provide loans to low income earners on an interest free basis to pay for essential household items such as whitegoods. DO YOU HAVE OTHER DEBTS – WATER, RATES, ELECTRICITY, PHONE BILLS? All utility companies and telecommunications companies have hardship policies, and can provide assistance by reducing or postponing your repayments. If you are experiencing difficulties negotiating with your provider you can contact the Telecommunications Industry Ombudsman on 1800 062 058 or www.tio.com.au for telecommunications or the Energy & Water Ombudsman in your state.